Turkey Gift Certificates & Vouchers for Employees | gThankYou! Looking for a meaningful, appreciated and convenient employee gift for the holidays? The gift of a holiday turkey evokes the gratitude and joy of the season and is gift that everyone values and appreciates. gThankYou! Turkey Gift Certificates make it easy and convenient for gift-givers and recipients love choosing the turkey that's best for their family. Good for Any Brand of whole turkey. Your company name printed on Certificates. Free! How do gThankYou! Turkey Gift Certificates work? gThankYou! 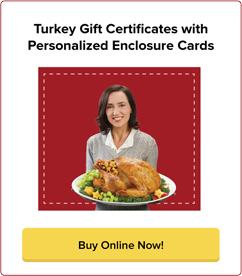 Turkey Gift Certificates are Manufacturer Coupons redeemable for any brand of whole turkey, at virtually any grocery chain store in the U.S. Recipients choose the size and preparation of turkey they want for their family – when and where they would like to shop. Our turkey vouchers are a meaningful gift that everyone appreciates – especially at the holidays! Gift-givers love the convenience of sharing an employee holiday turkey gift that can be delivered easily in person, fit in a holiday or payroll mailing, or tucked into a gift basket. Recipients love the flexibility to choose the brand and size turkey they want as the centerpiece to their holiday celebration. Watch our video on the left to see how gThankYou makes employee gift-giving easy for you, at Thanksgiving, Christmas or anytime! How can recipients redeem their Gift Certificates? Recipients redeem their gThankYou Gift Certificates just like cents-off Manufacturer Coupons, at virtually all major grocery chain stores, anywhere in the United States. Recipients choose any brand turkey at the time they want it. The stores that do not honor gThankYou Gift Certificates are stores that do not honor any Manufacturer Coupons such as the club stores, Sam’s and Costco, specialty stores such as HoneyBaked Ham and Aldi stores. 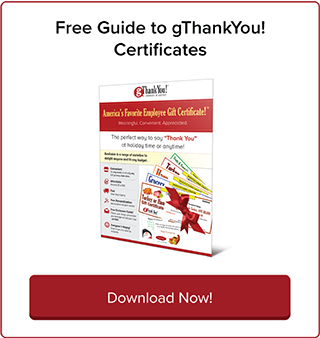 Download our one-page guide on “How to Redeem Your gThankYou Gift Certificate” to share with recipients, inform managers and post in workrooms. It’s available in English and Spanish. gThankYou also offers a FREE “Ultimate Thanksgiving Turkey Cookbook” to share with recipients, for cooking the perfect turkey centerpiece. How do I order? When will my order ship? It’s easy! Place your order online or call us at 855-730-5006. Virtually all orders ship same day so you can have your Certificates as soon as the next business day. Order today, delight your workplace tomorrow! Is there a discount if I buy a large quantity of Turkey Vouchers? Yes! Customers with large turkey voucher orders receive volume pricing. Call us at 855-730-5006 to learn more. Have a distributed workforce or many locations? We can help with customized online ordering and fulfillment. Call us to learn how we can make employee gift-giving convenient and affordable for your organization. What does a Turkey Gift Certificate look like? How do I choose free gThankYou Enclosure Cards, add a logo and custom message? Your employee gift needs a Thank You card to go with it, and we have you covered! Every purchase of gThankYou! Certificates of Gratitude comes with your choice of customizable Enclosure Cards - FREE! Cards are 3-inches high by 4-inches wide (3" X 4") and printed on high-quality cardstock. Add your personal message and even your company logo if you wish. We create a proof of your card-design, and once you approve it, send the free cards with your order. Choose from dozens of Enclosure Card designs perfect for Thanksgiving, Christmas and Winter Holidays or anytime gratitude! What is the difference between Turkey Gift Certificates, Gift Cards and Gift Checks? gThankYou! Turkey Gift Certificates allow recipients to choose any brand and size whole turkey — Butterball®, Norbest®, Smithfield® or any other brand from major grocery stores in the U.S.
gThankYou Certificates are Manufacturer Coupons which are only good for a specific item (such as a whole turkey), have an expiration date and provide no cash or residual value. They cannot be deposited in the bank or used to buy other merchandise. Gift cards allow consumers to buy any store merchandise. Butterball® Gift Checks, and other holiday gift checks, can be deposited in a bank account and used to buy any merchandise. Companies choose gThankYou Gift Certificates because they are Manufacturer Coupons. If you are concerned with the tax implications of employee gift-giving, please consult with your accounting or tax professional. Why should we give our employees a Thanksgiving turkey? Sharing a Thanksgiving turkey is a popular workplace gift tradition going back generations. A turkey is a thoughtful, uniquely American gift that’s an iconic symbol of gratitude and is enjoyed by the whole family. When your employees sit down to enjoy their holiday turkey, your company and your appreciation will be on their minds. Sharing Turkey Gift Certificates in your workplace is practical, meaningful and smart for business. Download “10 Reasons to Give Employees a Turkey for the Holidays” for a one-page sheet to share with your Management team. gThankYou makes employee holiday gift-giving easy and convenient so you can focus on what’s really important – sharing your gratitude with employees.